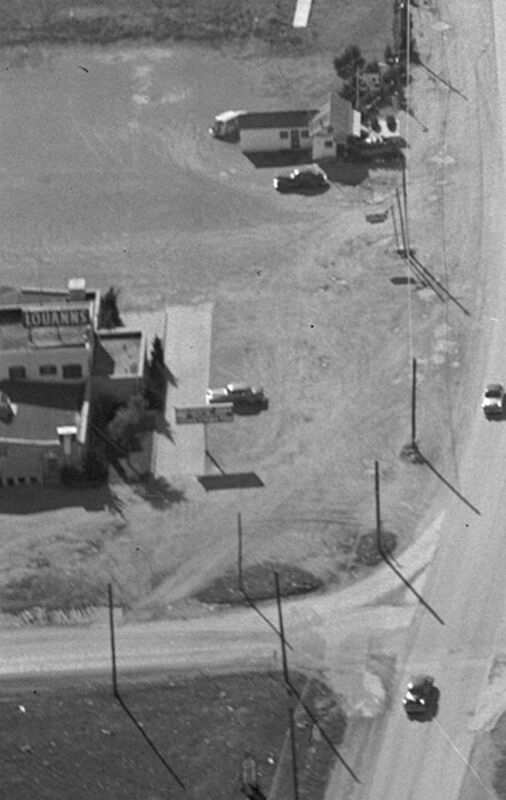 Here’s another great aerial photo by Squire Haskins, taken on June 6, 1957 — sixty years ago. The view is to the north, from a little south of Mockingbird. Mockingbird runs from left to right at the bottom of the photo; at the far right you can see the still much-missed Dr Pepper plant, which stood at the northwest corner of Mockingbird and Greenville Avenue. The only “tall” structure north of Mockingbird is the Meadows Building, at Greenville and Milton, just south of Lovers Lane. North and east of Lovers and Greenville is … pretty much nothing. The old Vickery community was north on Greenville, around what is now Park Lane. To the east? I don’t know … lots of open land and then … Garland? Let’s turn it around and look south, toward downtown, from just north of Lovers Lane, with the Meadows Building in the foreground. Greenville is at the left, Central Expressway at the right. This photo, also by Squire Haskins, was taken on June 20, 1956. If, like me, you’ve always wondered where the legendary Louanns nightclub was, it was just out of frame at the bottom left of the photo above — at the southeast corner of Lovers and Greenville, where Central Market sits these days. You can see it below, in a detail of another great Squire Haskins photo (click on the thumbnail of the photo on this page to see the full photo) — it was taken on Dec. 4, 1953 and shows the Meadows Building under construction. In this detail you can see a slightly blurry Louanns, with what looks like an unpaved Lovers Lane at the bottom and Greenville Avenue at the right. 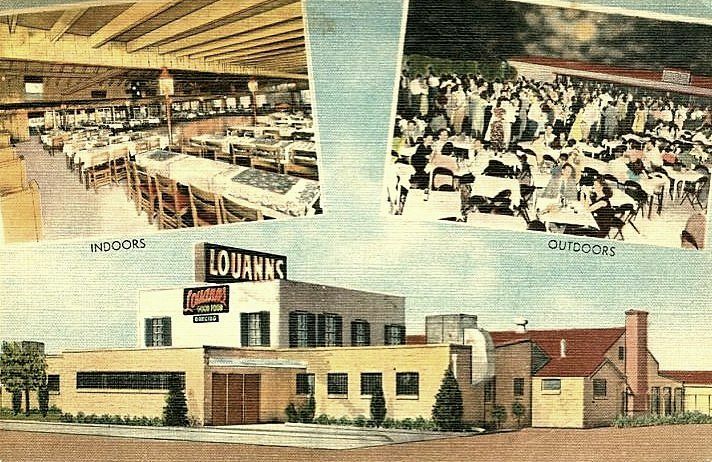 I’d always heard that Louanns was way out in the sticks in its heyday in the ’40s and ’50s. And looking at the top photo, I can see how true that was — especially before the arrival of the Meadows Building, which was, I believe, the largest “suburban” office building in Dallas beyond the downtown Central Business District. And for those who went out “parking” along Lovers Lane back then, you can see how the street got its name. 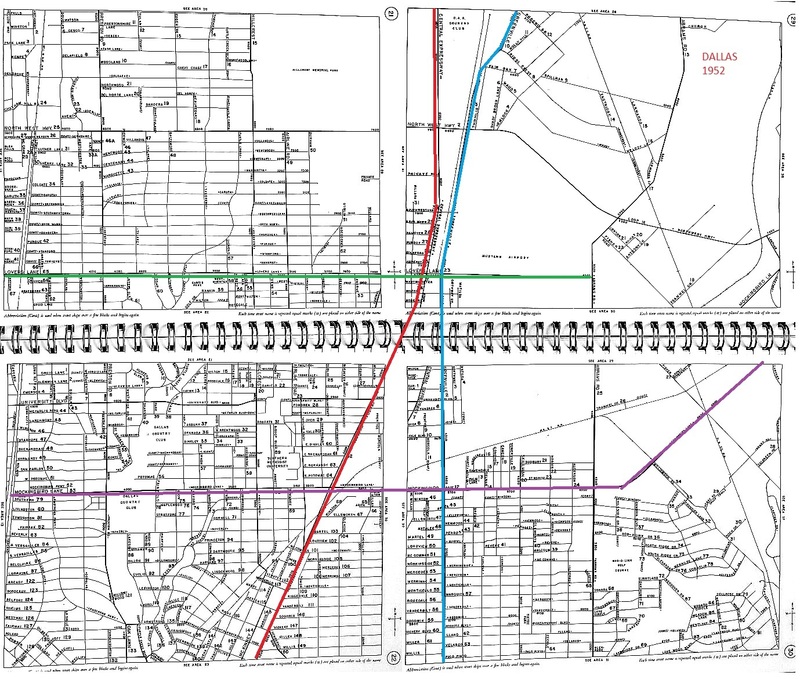 Here is a clipping from the 1957 Dallas city directory showing the businesses along East Mockingbird — between Airline, west of Central, and Greenville Avenue. See the Greenville Avenue businesses from the same 1957 directory here (the directory is scanned in its entirety on the Portal to Texas website here). Today? The area looks like this. Images are larger when clicked. Lovers Lane did *not* get its name from being a makeout area. Ha! I always assumed it did. I tried to find a concrete answer for this a couple of years ago, but I wasn’t successful. Where does it get its name from? My father, who graduated from SMU in 1932, told me he used to ‘park’ om LL with girls. At the time LL was an un-named dirt farm road north of campus where SMU and Highland Park kids went to make out. If LL didn’t get its name that way, how was it named, hmmm? Of course, Mrs. Baird’s. The “day old shop” doesn’t show up, though, so I wonder if it was there yet back in ’57. During a rough stretch a lot of our baked goods came from there. The Western Electric plant on the N. side, which is now loft-condos, and the Bekins storage building on the S., which I think is the storage building there, but it may not be the same bldg. I remember Osburn Furniture and of course Campisi’s which is still there. The Centennial liquor store was there until not too many years ago. I guess the Levee also came in after ’57. If you kept going, there was Lone Star Donuts (the best!) and the Piggly Wiggly. How about Kip’s? was it there in ’57 or did it come in later? In the city directories (you posted a link to some a while back) where is the street by street listing, and does it cover residential streets too? I was only able to find the listings by name of person or business, but that’s not helpful in trying to see who owned a particular house at a particular time. The street directory portion of the city directories was generally either at the very beginning of the book (after a few preliminary pages) or at the end of the alphabetical listings and right before the business pages. I’ve been doing it a long time, so I have kind of a feel for it, but, yes, it can be pretty tedious finding a specific street without a lot of narrowing down. The directories available on the Portal to Texas History site (which includes the 1957 one linked above) are very difficult to navigate as far as the street directory portion. It’s (somewhat) easier to use the database/scans available through the Dallas Public Library/Ancestry. But it still takes a lot of stabs in the dark before you can begin to hone in on what you’re looking for. Prior to the Kips was a Barbeque restsurant at that location. Oh, another memory is the Lovers Lane riding stables where Old Town and the Village apartments are now. I have ridden (rented) horses over that very land. I am squire Haskins son, Ben. I took over the business in 1970. Donated negatives in 2005. I was just talking to the archivist at UTA a couple of days ago, and I told her that the collection of your father’s photos are such a WONDERFUL and important visual chronicle of Dallas’ history. Thanks to your father and to you for donating them! I’m not sure of exact chronology, but as late as 1955 or so there was on the southeast corner of Mockingbird and Greenville (where Kip’s was later) a remarkable barbecue joint that, to me, looked like a bait shop from prewar Lake Dallas (this is in my imagination, understand). How such a modest and rural-looking enterprise managed to be on that corner at such a late date is pretty amazing. Perhaps by the time the ’57 city directory was published it was history but Kip’s hadn’t arrived. You’re right, Bob. It was called Corner Barbecue, but it had a Greenville Ave. address rather than a Mockingbird address — it was between Winton and Mockingbird. I linked to the Greenville Ave. page in the 1957 directory in the post. Right next door to the BBQ place was another restaurant, the Davis Drive Inn. You are correct sir. I remember it well. I went on that tour as a Bluebird or Camp Fire Girl. I can still taste that incredible warm bread! The Mrs. Baird’s tour was still running in the early 90s, as my wife took our niece through at that time. I was at work. I am so sorry I missed it; I vaguely remember taking the tour in 1st or 2nd grade. But I didn’t realize that just a few years later the whole place would be bulldozed and gone forever.